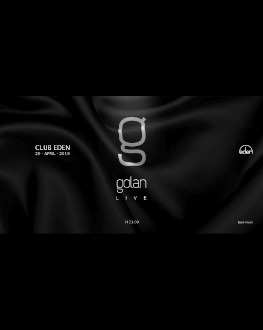 On the 20th of april GOLAN’s European Tour ends in Club EDEN, Bucharest, starting 9 p.m.
Coming from different musical backgrounds, the now five active members of Golan cultivated a recognisable sound of their own. By mixing a vast array of instruments, both live and in the recording studio, they definitely stand out. Formed in 2014, the group has had one of fastest ascents on the Romanian electronic music scene. Quick to establish band status, they have been largely credited for bringing a whole new feel/ vibe to their niche, much more so through their intense, remarkable live shows. The authenticity and ever evolving complexity of their music and live shows made way for a fast growing fan base at home, while also becoming a new addition to many European indie festivals and events. Touring with Parov Stelar throughout Europe’s biggest cities and on their own at international festivals like Sziget, Open’ er Festival, United Islands of Prague, Fete de l’Europe, Euripa Vox, Frequency Festival, Burg Clam Festival, Festival au Bord de L’eau, Malwiese Festival, Eurosonic, Budapest Showcase Hub Festival along few others.